This exhibition presents my research on tatau, traditional tattooing practices in Samoa. My research brings together interviews and surveys with thirty-eight individuals in Samoa undertaken from January to May 2016 as well as library and archival research I conducted to complete my senior requirements in International Studies in fall 2016. I conducted the majority of my interviews and observations in Apia on the island of Upolu, Samoa, and in Pago Pago, American Samoa. There I was fortunate to learn about tatau from several cultural experts including tufuga ta tatau (experts in traditional tatau), tape’a (contemporary tattooists), and artists working in other media such as painting, woodcarving, and tapa cloth. These individuals included Su’a Sulu’ape Peter, Su’a Sulu’ape Paulo III, Siligatusa Tataimata Lalovai Peseta, Nikki D. Mariner, Mark Ashley Faulkner, Toleafoa Chris Solomona, Vanya Taule’alo, and many others whose contributions to this work I deeply appreciate. As a part of my research and explorative process, I also made paintings exploring the designs and complexity of Samoan tatau. Receiving my tattoo was an extremely important piece of the work, as I believe that one cannot fully understand tattooing, specifically tatau, without having been tattooed. This research has also inspired me to teach a class about the significance of tattooing traditions around the world. I have also compiled a bibliography of readings for anyone who would like to learn more. The photographs featured in the exhibition detail the process of tatau while the accompanying text explains the process, aspects of its history and significance, and stories shared during interviews. All the photographs in the exhibition were taken by or for me with the permission of the individuals they represent. During our interview, Toleafoa Chris Solomona told me, “Samoan design speaks of connection to each other, respect, survival, protection, and strength. The process challenges us to make us strong. It gives purpose. It is our duty to live up to the markings on our skin. We now have a role to play throughout the rest of our lives.” This is the way I feel about this research, as it has challenged me and given me purpose. The work I have done is all about the markings on our skin, the ways in which we choose to tell our stories, and what those stories on our skin actually are. I have great admiration for the tattoos themselves and the utmost respect for the artists who create them and who continue to inspire me and my work. Sophia Higginbottom will graduate with a Bachelor of Arts in International Studies from Denison University in May 2017. She also earned an Associate of Liberal Arts degree from Cuyahoga Community College in 2014. Higginbottom studied with the School for International Training in Samoa, American Samoa, Hawaii, and Fiji during 2016. During this time, she conducted many interviews about tatau and had the honor of studying the work of the Su’a Sulu’ape family. The research on which this exhibition is based was compiled in two previous projects: Tattoo Sāmoa: An Exploration of the Significance of Tattooing and Sāmoan Identity and The Exploitation of Indigenous Cultures: The Significance of Sāmoan Tattooing. Higginbottom has also presented her research at the University of the South Pacific, the School for International Training, and Denison University. Thank you to Dr. Joanna Grabski for believing in this work, helping me through the associated processes, and for allowing me the platform to display this work in a way it can be shared. My gratitude to Dr. Isis Nusair for checking on me and inspiring me through my college career, whether you knew it or not. To my entire family for always supporting my endeavors no matter how crazy they sounded, for making me a better person, and for motivating me every day to be my best. To Jackie Fa’asisila for welcoming me into your life and home, for sharing with me the things you know, and for helping to show me more of myself. To the Su’a Sulu’ape family for welcoming me to watch you work, take photographs, interview you, and for tattooing me, an experience I will never forget. I am grateful to everyone else who has helped with this work, whether with revisions, interviews, or advice. I truly appreciate your support. This photograph depicts men at the Samoan Tourism Authority’s Samoan Cultural Village performing a dance for tourists in a staged fiafia ceremony. 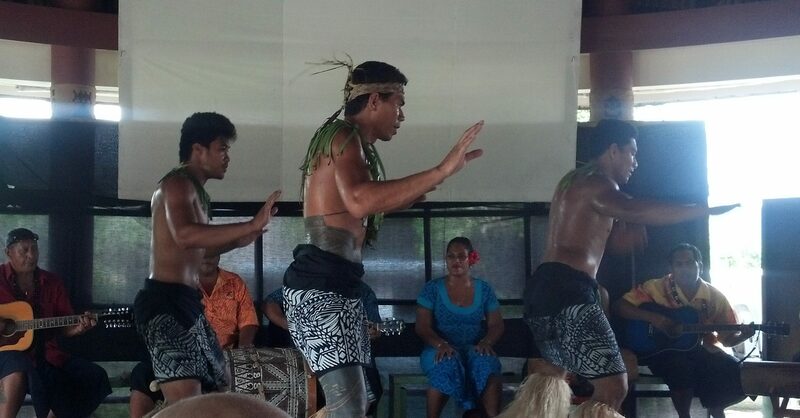 The man in the center bears a full pe’a, and the ‘ie lavalava each performer wears portrays the patterns of tatau. There are many “rituals” or traditions associated with tatau. In order to share these with tourists, aspects of those traditions are reenacted for their viewing pleasure. This is a photograph of Toleafoa Chris Solomona, a very experienced cultural guide at the Samoan Tourism Authority’s Samoan Cultural Village. 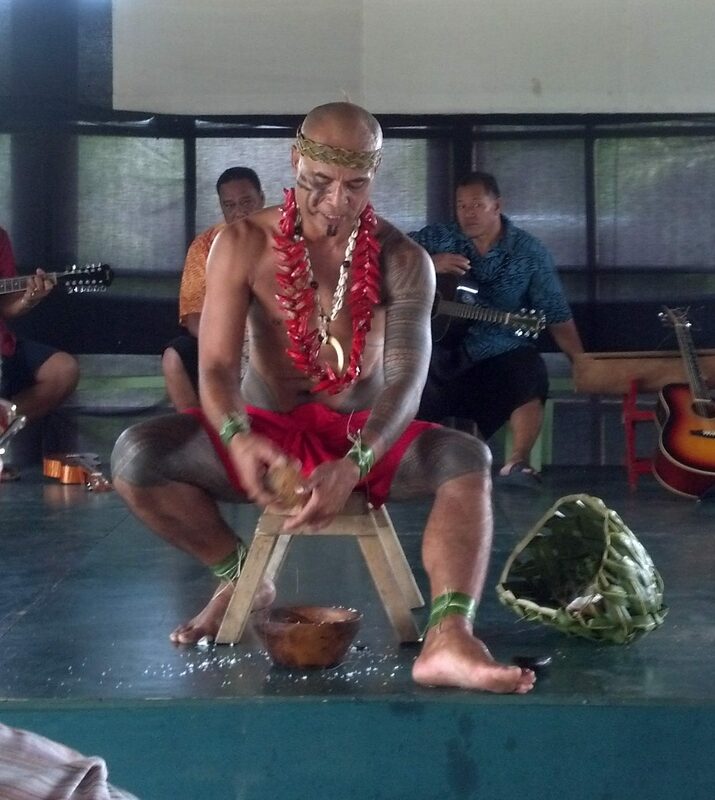 Solomona exhibits a full pe’a (Samoan male traditional tattoo) and taulima (arm/sleeve tatau), warrior face paint, traditional necklaces, grass headband, ankle bands, and wrist bands, while demonstrating for tourists how to clean out a coconut. To his left is a traditional grass–woven basket. In an interview with Solomona, he explains that all of his tattoos were created with the ‘au and sausau, the traditional tools of tatau. This photograph depicts Su’a Sulu’ape Peter, seated at left and holding an ‘au, creating a pe’a for a Samoan man. 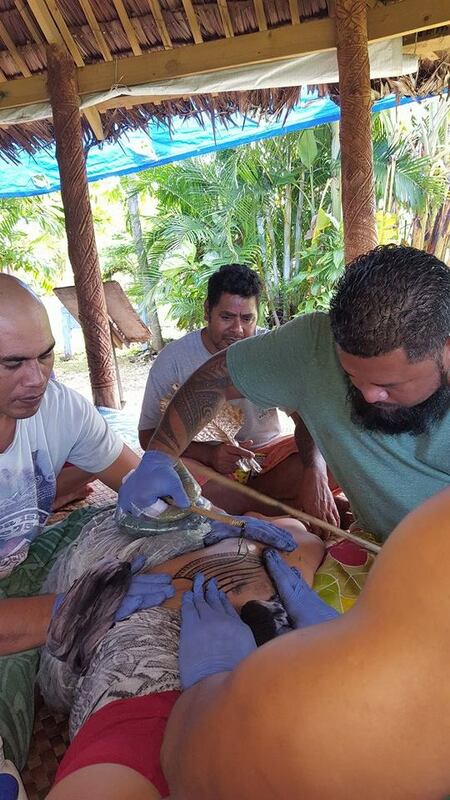 He is accompanied by his stretchers who wipe away the excess ink, while the tufuga ta tatau (tatau artist) and soga’imiti (man being tattooed) inspect the tattoo and prepare to continue the process. This process of receiving the pe’a takes 6 to 12 sessions of 4 to 8 hours each, depending on how much the tufuga and soga’imiti can handle at once. Generally, two stretchers are used for this process. The entire practice is a collaborative effort, demanding the patience of all participants. Here is a contemporary tatau design created by Su’a Sulu’ape Paulo III in April 2016. The design incorporates several motifs: the gogo (seagulls represent an individual’s journey whether in life, love, or physical travel); ataloa (centipedes represent strength and endurance; it is a great honor to have centipedes within the tatau); fusi (octopus tentacles which represent protecting one’s family, village, culture, and people more generally); spears (represent the protection of the family and culture); and aso (represent the walls of a home which suggest building a strong home for the family). This photograph depicts the sketch, drawn in marker, that precedes the tatau. This sketch was done by Su’a Sulu’ape Paulo III for an American woman in April of 2016. The subject is standing as she awaits the tattooist’s instruction to begin the tatau process. This photograph depicts Su’a Sulu’ape Paulo III preparing to tattoo an American tourist. After drawing an outline of the design, Su’a Sulu’ape Paulo III and a stretcher at left examine the skin and wipe away any lines that are unsatisfactory or unnecessary. The second stretcher in the back is preparing the sterilized ‘au, sausau, and ink. Stretchers may be apprentices learning to become tufuga themselves or they may desire to continue working as stretchers without the goal of becoming a tufuga. The fastest way to become a tufuga ta tatau is to be a stretcher/apprentice for the Su’a Sulu’apes, and when they believe you are ready they would bestow the title to you along with your first set of tools. This is a male dominated profession, and it can take years of apprenticeship before becoming a tufuga. This photograph shows Su’a Sulu’ape Peter tattooing an American man. There are two stretchers pulling the skin on each side while the tufuga ta tatau (master of tattooing) positions their hands to exactly where he wants them. He is using the ‘au dipped in ink to mark the skin where he will soon strike. This photograph shows a stretcher wiping away excess ink while Su’a Sulu’ape Peter prepares to continue tattooing. All parties involved in the tatau process wear an ‘ie lavalava (sarong/traditional tie cloth). The tufuga wears the cloth over his jeans and the American man being tattooed wears one rolled to expose skin for the tatau. We can also see the marker lines drawn on the skin to guide the tufuga. This photograph depicts Su’a Sulu’ape Peter preparing the bagged towel for leverage in his hand with the ‘au, positioning them to the correct angles. This photograph depicts Su’a Sulu’ape Peter tattooing an American woman using the ‘au and sausau (traditional Samoan tatau tools) at the Samoan Tourism Authority’s Samoan Cultural Village in April 2016. This is the most common place in Samoa for tourists to get a tattoo. When Samoans receive tatau, the tufuga ta tatau is invited to the home of the soga’imiti (person being tattooed) and housed and fed until the tatau process is completed. 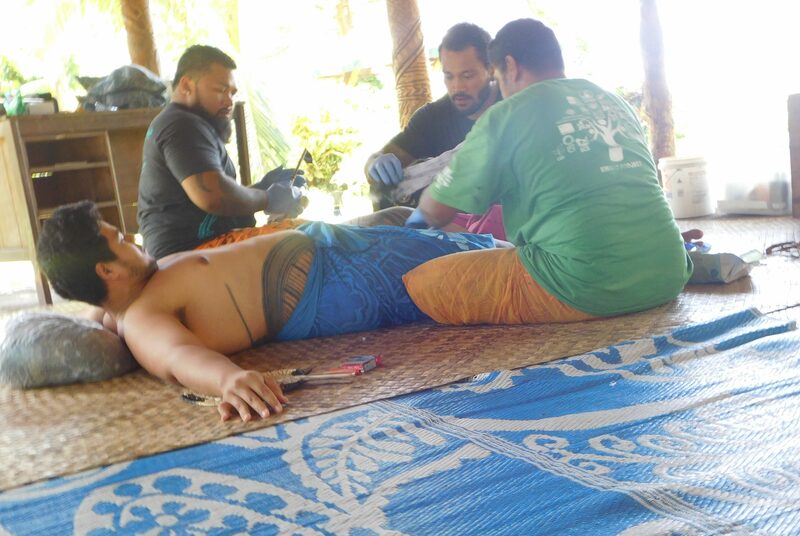 Two stretchers are pulling the skin taut, while the tufuga ta tatau inserts the ink by tapping and using the traditional tools and a plastic wrapped towel for leverage against the skin. The man in the back fans the tattoo in order to keep away any flies or other insects in the open fale. 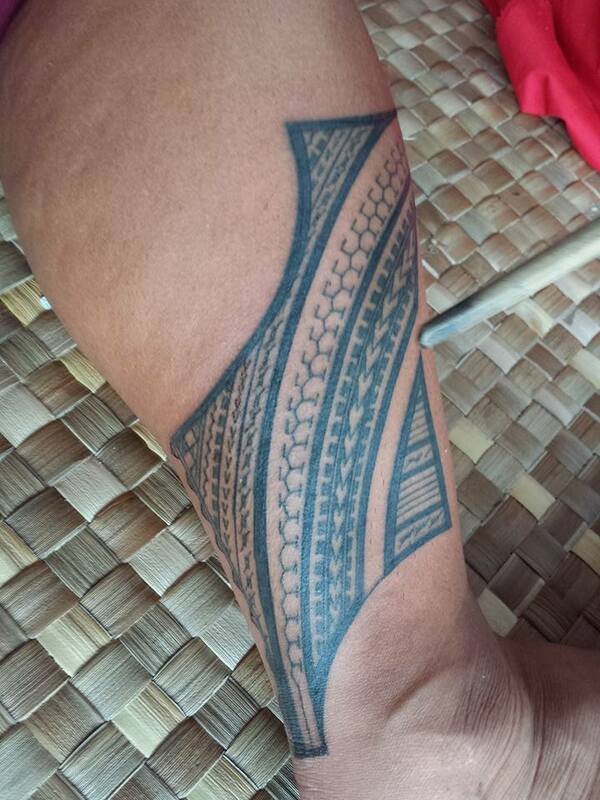 Here is a contemporary tatau design created by Su’a Sulu’ape Paulo III at the Samoan Tourism Authority’s Samoan Cultural Village in Apia, Upolu, Samoa in April of 2016. The tatau symbolizes femininity, hope, and travel or the journey. The diamond shape in the center is called a malu, a motif referring to femininity, fertility, and childbirth. 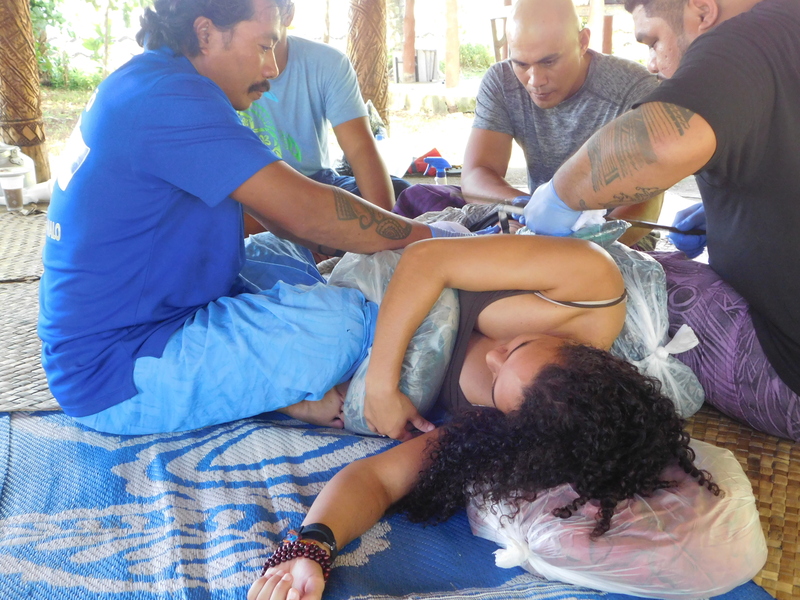 This is a photo of Sophia Higginbottom, as a participant and observer, being tattooed by Su’a Sulu’ape Paulo III at the Samoan Tourism Authority’s Samoan Cultural Village in Apia, Upolu, Samoa on April 26, 2016. The plastic bags of towels and three stretchers for this area of the body (right hip) hold her in place and keep the skin taut for the tufuga ta tatau (master of tattooing). Two stretchers hold her skin for the tufuga while another sits and holds her legs and feet still during the process to prevent any movement due to the pain or time it takes to complete the tattoo. This was an extremely important aspect of my research, as one cannot fully understand tattooing, specifically tatau, without having been tattooed. This photograph depicts the researcher’s finished tatau created by Su’a Sulu’ape Paulo III at the Samoan Tourism Authority’s Samoan Cultural Village in Apia, Upolu, Samoa on April 26, 2016. Notice the raw texture of the skin after the tatau process. This design took 20 to 35 minutes to complete. The shape refers to an ocean wave or a va’a (boat/sailboat). It incorporates the motifs of gogo (seagulls representing a person’s travel or journey), ataloa (centipedes representing strength and endurance), fusi (octopus’ tentacles representing protection of family, village, culture, and people more generally), and aso (walls of a home representing building a strong home for the family). It is an honor to be able to carry with me this marking and all of the significance that comes with it. 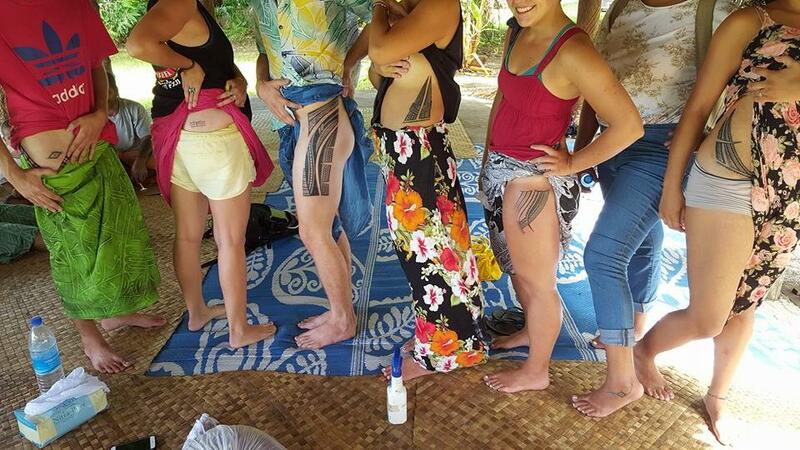 This photograph shows the tattoos created by Su’a Sulu’ape Paulo III and Su’a Sulu’ape Peter in April 2016 for a group of American students studying in Samoa on the island of Upolu. All were tattooed using traditional ‘au and sausau tools with contemporary design patterns at the Samoan Tourism Authority’s Samoan Cultural Village in downtown Apia, Upolu, Samoa. ‘aso – rafter or cross beam of a fale. In reference to construction. Representing support and strength, as well as the protection of family and service to others. ‘au – traditional Samoan tattooing instrument composed of a wooden rod, turtle shell, and bone comb. Materials may vary due to time and place. Ataloa – centipede. Representing strength and endurance. Fa’a – Samoan prefix translated to “in the way of” or “like”. Fa’alavelave – ceremonies and celebrations that require large amounts of gift giving and time (i.e. weddings, funerals, holidays, etc.). Fa’a’ali / fa’avaeali – like the feet of the headrest. Fa’avaetuli – like the legs of the bird or golden plover. Fa’anufe – worm or snake like. Fa’asamoa – “the way of Samoa” referring to traditions and culture of Samoa. Fa’asigano / Fa’amuli’ali’a – like the pandanus blooms or like trochus tips. Fish – Representing family lineage and the passing of culture from one generation to the next. Fusi – “octopus’ tentacles” representing strength and protection. Gogo – sea swallows / gulls. Also known as “journey birds.” They represent the journeys we take in life. ‘ie toga – fine mats. ‘ie lavalava – a simple garment for both sexes composed of a single piece of material wrapped around the body and tied or tucked in. Usually referred to simply as i’e or lavalava. 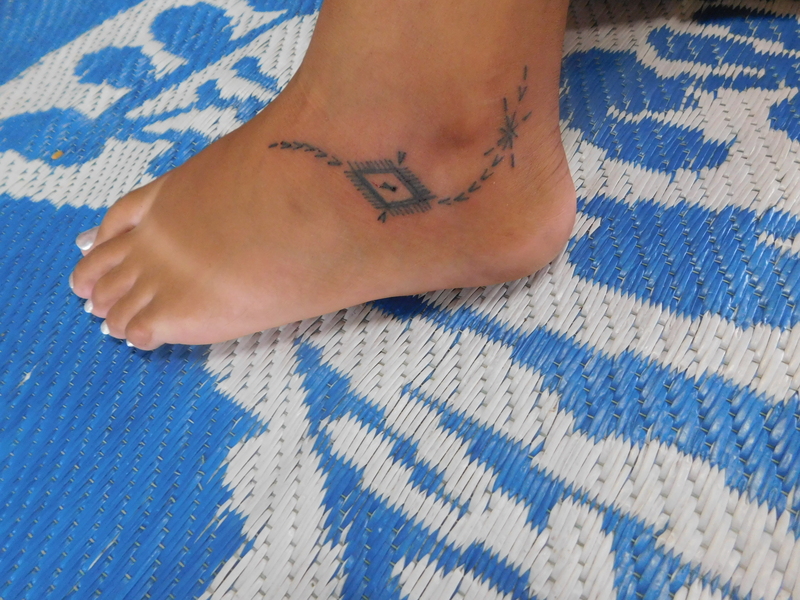 Malu – traditional Samoan female tattoo named after the diamond shaped designs usually placed at the back of the knees. Tattoo extends from the top of the thighs to behind the knees. protection or shadow. Symbolizing protection of the family, community, and others. Matai – chief or leader of the family who is chosen by the family they lead. O le Taga Tapulu – the first session of the tatau (pe’a), to strike the back and the small of the back. Palagi – non-Samoan, usually meaning of European descent. Pe’a – traditional Samoan male tattoo which extends from the lower rib cage to below the knees, covering everything in between except the genitalia. Also refers to a bat or flying fox. Pisikoa – Peace Corps volunteer. Soga’imiti – man with traditional Samoan tatau. Sausau – traditional tapping rod used to strike the ‘au during tatatau. Spear. Representing warrior and the protection of the ‘aiga at any cost. Siapo – decorated bark cloth art of Samoa. Also referred to as tapa. Tapa – Polynesian word for bark cloth. Tatau– traditional Samoan tattoo (malu or pe’a) done using the ‘au and sausau. May also refer specifically to pe’a. Tatatau – the process of traditional Samoan tattooing using the ‘au and sausau. Taulealea – untattooed young men. Taulima – armband or wrist band. Tautua – service to community, family, etc. Tauvae – ankle, leg, or thigh band. Togitogi – dots. Translating to “to mark on wood with an ax.” Representing protection and the work women must do. Tufuga ta tatau – master tattooist of traditional Samoan ‘au and sausau. Va’a – boat or canoe. 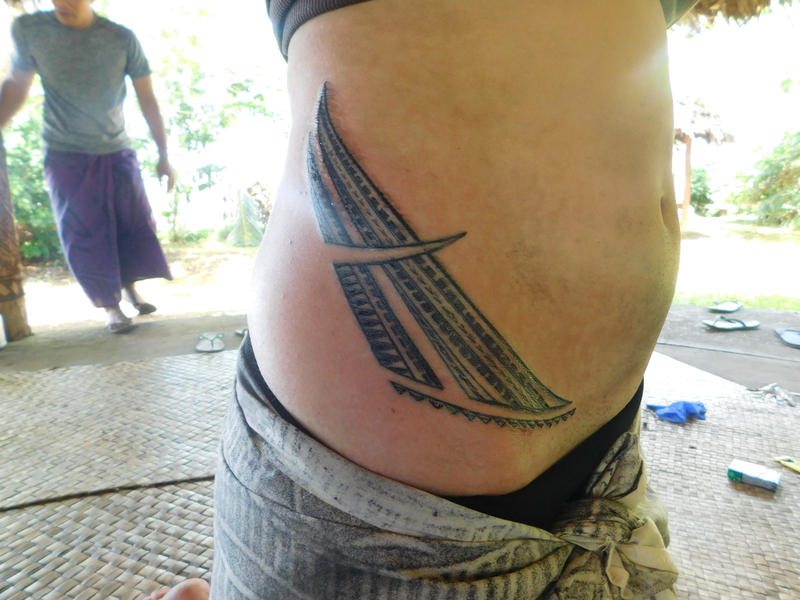 Design used in many tattoos, also the portion of the pe’a that rests on the lower back representing the boat. Speaks of what is expected of a man: knowing how to sail and fish to get food for his family if that is what is necessary to survive. Vaetuli / vaevaetuli – leg(s) of the golden plover. Adams, Mark and Nicholas Thomas with Sean Mallon, Peter William Brunt. 2010. Tatau: Samoan Tattoo, New Zealand Art, Global Culture. Te Papa Press. Allen, Tricia. 2010. The Polynesian Tattoo Today. Mutual Publishing Company. Awekotuku, Ngahuia Te, with Linda Waimarie Nikora, Mohi Rua, Becky Nunes, and Rolinda Karapu. 2007. Mau Moko: The World of Maori Tattoo. Honolulu, Hawai’i: The University of Hawai’I Press. Beeler, Karin. 2006. Tattoos, Desire, and Violence: Marks of Resistance in Literature, Film and Television. USA: McFarland & Company, Incorporated Press. Brouwer, Dan. 1998. “The Precarious Visibility Politics of Self-Stigmatization: The Case of HIV/AIDS Tattoos.” Text and Performance Quarterly, 18: 114-136. Caplan, Jane. 2000. Written on the Body: The Tattoo in European and American History. Reaktion Books, Limited. DeMello, Margo. 2000. Bodies of Inscription: A cultural history of the modern tattoo community. Durham & London: Duke University Press Books. DeMello, Margo. 2014. Inked: Tattoos and Body Art Around the World. Vol. 2: M-Z. Santa Barbara, California, Denver, Colorado, & Oxford, England: ABC-CLIO, Incorporated. Dinter, Maarten Hesselt Van. 2005. The World of Tattoo: An Illustrated History. Amsterdam: KIT, Koninklijk voor de Tropen. The Drawing Center and Don Ed Hardy, eds. 1995. Pierced Hearts and true Love: A Century of Drawings for Tattoos. New York & Honolulu. Ellis, Juniper. 2008. Tattooing the World: Pacific Designs in Print and Skin. New York: Columbia University Press. Ellis, Juniper. 2006. “Tatau” and “Malu”: Vital Signs in Contemporary Samoan Literature.” Modern Language Association, (September) 2016. Http: jstor.org/stable/25486348. Fellman, Sandi. 1986. The Japanese Tattoo. Abbeville Publishing Group. Fenske, Mindy. 1969, 2007 ed. Tattoos in American Visual Culture. Palgrave Macmillan. Figiel, Sia. 1999. They Who Do Not Grieve. New Zealand & New York, NY: Random House of Canada, Limited. Fornal, Amanda D. 2012. South Pacific Skin. New Zealand: Lulu.com. Garcia-Merritt, Gabriel. 2014. Inked Lives: Tattoos, Identity, and Power (Master of Arts Thesis). Iowa. Handy, E.S. Craighill. 1971. Samoan House Building, Cooking, and Tattooing. Kraus Reprint. Higginbottom, Sophia. 2016. Tattoo Sāmoa: An Exploration of the Significance of Tattooing and Sāmoan Identity. School for International Training, Database for Independent Study Projects. Samoa. Higginbottom, Sophia. 2016. The Exploitation of Indigenous Cultures: The Significance of Sāmoan Tattooing. Denison University. USA. Hiramoto, Mie. 2015. “Inked Nostalgia: Displaying Identity through Tattoos as Hawaii Local Practice.” Journal of Multilingual and Multicultural Development, 36:2, 107-123. http://dx.doi.org/10.1080/01434632.2013.804829. Kuwahara, Makiko. 2005. Tattoo: An Anthropology. Oxford & New York: Bloomsbury Academic. Marquardt, Carl. 1984. The Tattooing of Both Sexes in Samoa. R. McMillan. Mason, Jean Tekura. 2001. Tatau (Tattoo). Suva: Mana Publications in association with the Institute of Pacific Studies, University of the South Pacific. Murray, Soraya and Derek Conrad Murray. 2008. “On Art and Contamination: Performing Authenticity in Global Art Practices.” Journal of Contemporary African Art. Spring / Fall, 88-93. Phelan, Michael P. and Scott A. Hunt. 1998. “Prison Gang Members’ Tattoos as Identity Work: The Visual Communication of Moral Careers.” Symbolic Interaction, Vol. 21, No. 3, pp. 277-298. September 7, 2016. http://www.jstor.org/stable/10.1525/si.1998.21.3.277. Rubin, Arnold, eds. 1992. Marks of Civilization: Artistic Transformations of the Human Body. Los Angeles: University of California Los Angeles, Fowler Museum of Cultural History. Schwarz, Maureen Trudelle. 2006. “Native American Tattoos: Identity and Spirituality in Contemporary America.” Visual Anthropology,19: 223-254. Taliaferro, Charles and Mark Odden. 2012. Tattoos: Philosophy for Everyone: I Ink, Therefore I Am. First Ed. Wiley – Blackwell. Taule’alo, Vanya. 1999. “Tattooing in Contemporary Samoan Society”. Tatowier Magazine, Germany. Thomas, Nicholas, Anna Cole, and Bronwen Douglas, eds. 2005. Tattoo: Bodies, Art, and Exchange in the Pacific and the West. Durham: Reaktion Books, Limited. Van der Ryn, Micah. Tattooing at the Center. Video. Van der Ryn, Micah. Tatau: What One Must Do. Video.